Mono Lake, the source of the bacteria that can incorporate arsenic, rather than the usual phosphorus, into its DNA.The world is buzzing about the bacteria from Mono Lake. Astrobiologists from NASA discovered in the lab that this strain of bacteria, called GFAJ-1, can incorporate the element arsenic, instead of phosphorus, into the backbone of its DNA. Before this discovery, we thought all organisms needed phosphorus to live. Now, as QUEST blogger Ben Burress points out, life is no longer quite as we know it—and this changes the way we think about the search for life on other planets. 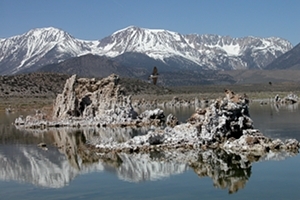 But before we go to Mars, let’s explore a very otherworldly place on earth—the place where the bacteria GFAJ-1 and its arsenic came from, Mono Lake. Mono Lake is on the east side of the Sierra Nevada Mountains, about 300 miles by car from San Francisco. It is an amazing landscape; the lake is set against the backdrop of the snow-capped mountains. There are crispy shrubs nearby, but no trees. Crusty white towers, called tufas, rise up from the water. The water in the lake is snowmelt and rainwater runoff from the mountains. It enters the lake via streams. But the lake is a closed basin and has no drainage—water can only leave by evaporation. The water evaporates, but the salts and minerals, like arsenic, are left behind. As a result, the lake is very salty—twice as salty as the ocean—and is very alkaline, or basic. That super-salty water may not seem very hospitable, but in fact the lake is full of life. In addition to the now-famous bacteria, the lake is home to brine shrimp and the larvae of alkaline flies. During the summer, the brine shrimp number in the trillions. They feed on algae that grow green at the lake’s surface. The brine shrimp are food for the two million migratory birds that stop at Mono Lake to feed each year, and the nesting populations of California Gulls and Snowy Plovers. In addition to its cool geology and important role in North American bird ecology, Mono Lake is at the center of a water supply saga. Water levels in the lake were historically much higher. To get an idea of previous water levels, take a look at the tufas. They were formed while underwater. They’re made of calcium carbonate, which precipitated as fresh water bubbled up from the bottom of the lake. Thousands of years ago, the lake was as much as 900 feet deep, perhaps covering parts of Utah and Nevada. In recent history, the lake was about 170 feet deep. Beginning in the late 1800s, the freshwater streams that fed the lake were diverted by settlers so they could irrigate their farms. The water level started dropping. In 1941, four of the five streams that flowed into Mono Lake were diverted to the Los Angeles Aqueduct. Supplying the growing city of Los Angeles with water involved intrigue and duplicity and scandal, which were well documented in the book Cadillac Desert. Between 1941 and 1982, because of the reduced freshwater input, the water level in Mono Lake dropped by 45 feet. The drop in water level was bad for the migratory and resident birds, particularly the California Gulls, which nested on islands in the lake. As water evaporated, some islands become connected to the shore. The birds were no longer protected from roaming coyotes. And, more exposed shoreline meant that the wind kicked up alkaline dust storms. In addition the lake got saltier—at one point it was nearly three times as salty as the ocean. In response to these changes, the Mono Lake Committee, the National Audubon Society, and other conservation groups have begun to restore Mono Lake. It is now mandated that more water flow into the lake, and the water level has started to rise. The habitats and ecological processes of the lake are recovering. Additional discoveries, like the bacteria that can use arsenic to make its DNA, will hopefully rise out of Mono Lake in the future.